There’ve been plenty of studies in recent years examining the relationship between screen time and mental health, particularly among children. 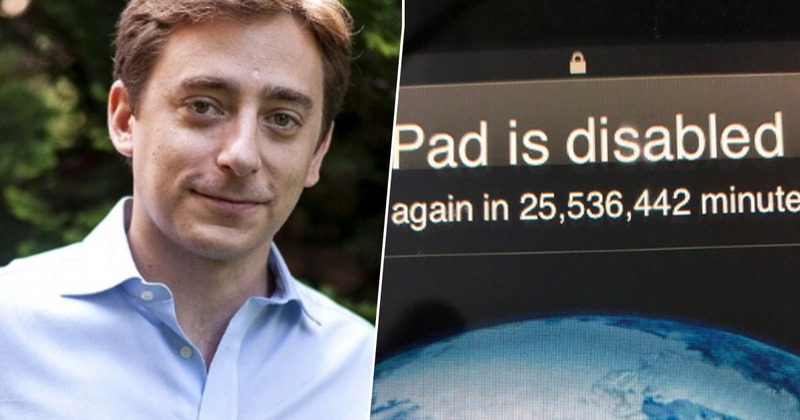 There hasn’t, however, been any investigation into the effects on a parent’s health when their three-year-old locks them out of their device for 25 million minutes by guessing the passcode incorrectly too many times. One person who might be able to shed some light on it though, is US journalist Evan Osnos, who took to Twitter over the weekend to share the results of his kid’s handiwork. The photo showed Evan’s iPad saying: ‘iPad is disabled try again in 25,536,442 minutes’. For those wondering, that’s about 48 years and 6 months, or 17,733 (ish) days, which is quite a wait when all you want to do is watch compilations of old Vines and fails on YouTube. There were, naturally, some helpful suggestions from fellow Twitter users. While it seems the younger generation grow up to be increasingly more tech savvy than their elders, it seems this three-year-old, and their long suffering dad, has got a little way to go. Let’s just hope Evan’s kid wasn’t as desperate to get their hands on an Apple product as Xiao Zheng, from China, was a few years ago. When Xiao was 17, he sold one of his kidneys on the black market so he could afford a new iPhone and iPad. He was reportedly paid 22,000 yuan (£2,000). The consequences, however, were serious and life-threatening, as Xiao – now aged 25 – needs round-the-clock care due to complications since the surgery. At the time, I wanted to buy an iPad2, but I didn’t have any money. When I was on the internet, I had a kidney agent send a message, saying that selling a kidney can give me 20,000. The teen wanted to hide the procedure from his family, and travelled to Hunan Province alone, where he was met by the surgeons who carried out the operation to remove his kidney. He was discharged after three days. After the operation, Xiao Zheng’s health deteriorated and his wounds became infected. He now reportedly suffers from renal deficiency, is dependent on kidney dialysis to survive, and has to live on benefits as he’s unable to work. Think I’d rather wait the 25 million minutes.